"NFL 2005 draft results (Round One)". National Football League (NFL). Archived from the original on January 12, 2008. Retrieved January 20, 2008. "NFL 2005 draft results (Second Round)". National Football League (NFL). Archived from the original on January 12, 2008. Retrieved January 20, 2008. "NFL 2005 draft results (Third Round)". National Football League (NFL). Archived from the original on January 12, 2008. Retrieved January 20, 2008. "NFL 2005 draft results (Fourth Round)". National Football League (NFL). Archived from the original on January 12, 2008. Retrieved January 20, 2008. 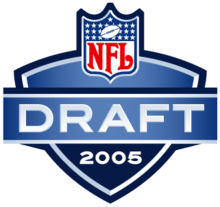 "NFL 2005 draft results (Fifth Round)". National Football League (NFL). Archived from the original on January 12, 2008. Retrieved January 20, 2008. "NFL 2005 draft results (Sixth Round)". National Football League (NFL). Archived from the original on January 12, 2008. Retrieved January 20, 2008. "2005 2005 NFL draft results (Seventh Round)". National Football League (NFL). Archived from the original on January 12, 2008. Retrieved January 20, 2008. ^ "NFL Draft moving to the Javits Center". The New York Times. March 5, 2005. Archived from the original on January 5, 2008. Retrieved January 20, 2008. Banks, Don (February 9, 2005). "NFL to move Draft:League will not hold event at MSG because of Jets tiff". SportsIllustrated.com. Retrieved November 15, 2008. ^ "Alex Smith (2005 NFL Draft)". Sports Illustrated. Archived from the original on December 31, 2007. Retrieved January 20, 2008. ^ "NFL 2005 draft results (Round One)". National Football League (NFL). Archived from the original on January 12, 2008. Retrieved January 20, 2008. ^ "NFL ANNOUNCES 32 COMPENSATORY DRAFT CHOICES TO 14 CLUBS". The Red Zone. Archived from the original on December 3, 2005. Retrieved December 16, 2008. ^ Jet (May 16, 2005). "Nine Blacks chosen in top 10 in 2005 NFL Draft". Find Articles. Archived from the original on July 9, 2012. Retrieved December 16, 2008. No. 26: NY Jets → Oakland. the Jets traded their first- and seventh-round selections (23rd and 230th) to Oakland in exchange for Oakland's second- and two sixth-round selections (47th, 182nd and 185th) and tight end Doug Jolley. No. 26: Oakland → Seattle. see No. 23: Seattle → Oakland. No. 47: Houston → Oakland. Houston traded their second- and third-round selections (47th and 78th) to Oakland in exchange for cornerback Phillip Buchanon. No. 47: Oakland → NY Jets. see No. 26: Oakland → NY Jets. ^ "NFL Draft Tracker: Denver Broncos, 1995 to 2008". FFToday.com. Retrieved November 14, 2008. No. 126: Denver → Cleveland. Denver traded their fourth-round selection (126th) to Cleveland in exchange for defensive tackle Gerard Warren. No. 126: Cleveland → Seattle. Cleveland traded their fourth-round selection (126th) to Seattle in exchange for quarterback Trent Dilfer. No. 126: Seattle → Carolina. see No. 45: Carolina → Seattle. No. 126: Carolina → Green Bay. see No. 89: Green Bay → Carolina. No. 144: N.Y. Giants → San Diego. see No. 12: N.Y. Giants → San Diego. No. 144: San Diego → Tampa Bay. San Diego traded their fifth-round selection (144th) to Tampa Bay in exchange for offensive tackle Roman Oben. No. 145: Arizona → New England. see No. 95: New England → Arizona. No. 148: Dallas → Philadelphia. see No. 132: Philadelphia → Dallas. No. 162: Green Bay → Kansas City. Green Bay traded its fifth- and sixth-round selections (162nd and 199th) to Kansas City in exchange for defensive end R-Kal Truluck. No. 175: San Francisco → Philadelphia. see No. 94: Philadelphia → San Francisco. No. 175: Philadelphia → Green Bay. see No. 126: Green Bay → Philadelphia. No. 175: Green Bay → New England. Green Bay traded its sixth-round selection (175th) to New England in exchange for New England's sixth- and seventh-round selections (195th and 246th). No. 175: New England → Oakland. New England traded its sixth-round selection (175th) to Oakland in exchange for Oakland's seventh-round selection (230th) and fifth-round selection (136th) in 2006. No. 182: Arizona → Oakland. Arizona traded its sixth-round selection (182nd) to Oakland in exchange for running back Troy Hambrick and defensive end Peppi Zellner. No. 182: Oakland → N.Y. Jets. see No. 26: N.Y. Jets → Oakland. No. 185: Dallas → Oakland. Dallas traded its seventh-round selection (223) in 2004 and sixth-round selection (185th) to Oakland in exchange for defensive end Kenyon Coleman. No. 185: Oakland → N.Y. Jets. see No. 26: N.Y. Jets → Oakland. No. 185: N.Y. Jets → Jacksonville. see No. 123: Jacksonville → N.Y. Jets. No. 195: Baltimore → New England. see No. 64: New England → Baltimore. No. 195: New England → Green Bay. see No. 175: New England → Green Bay. No. 203: San Diego → Tampa Bay. see No. 91: San Diego → Tampa Bay. No. 203: Tampa Bay → Cleveland. Tampa Bay traded its sixth-round selection (203rd) to Cleveland in exchange for quarterback Luke McCown. No. 230: Minnesota → N.Y. Jets. Minnesota traded its seventh-round selection (230th) to the N.Y. Jets in exchange for linebacker Sam Cowart. No. 230: N.Y. Jets → Oakland. see No. 26: N.Y. Jets → Oakland. No. 230: Oakland → New England. see No. 175: New England → Oakland. "2005 NFL Draft". Official NFL website. Archived from the original on January 6, 2009. Retrieved December 5, 2008. "2005 NFL Draft Compensatory Pick list". redzone.org. Archived from the original on December 3, 2005. Retrieved December 5, 2008.